Today I have a challenge for you, our wonderful readers! I have several feathers from our collection for you to identify. If you’ve ever been to Central Oregon, you know that the landscape is dominated mostly by dry shrubs. More rightfully a “sagebrush steppe” than a “high desert,” the Cove has plenty of sagebrush (Artemisia tridentata). It’s a plant that gets overlooked easily because it isn’t flashy, but it’s one that thrives in conditions where many other cannot, making it a pretty amazing species. Image by Pemus, from Wikipedia. Sagebrush is in the genus Artemisia, after the Greek goddess Artemis, which is actually in the sunflower family! Sagebrush is very different from sage, which is in the genus Salvia and includes the kinds of sages you’d use as edible spices. Sagebrush is not palatable except to pronghorn antelope and some other native critters, although it was used medicinally by First Nation tribes. See the three lobes? Image by Stan Shebs. 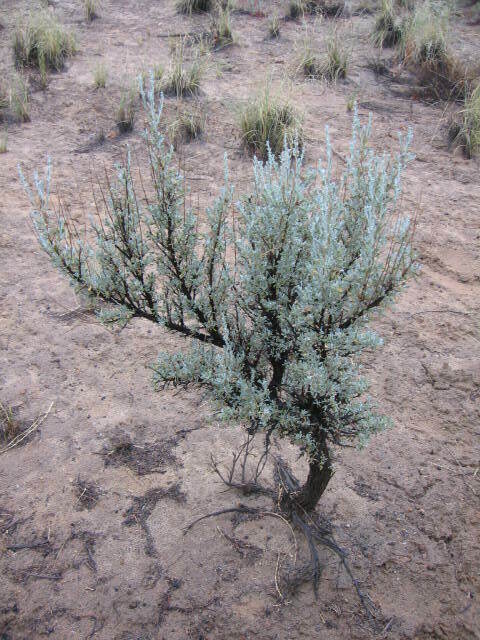 Since sagebrush lives in arid climates, it has several adaptations to help it conserve water. One is the small size of the leaves. Another is the tiny gray hairs that make the leaves feel fuzzy: these reflect sunlight and help keep water near the leaf’s surface, keeping the plant cooler. Sagebrush also grows small, temporary leaves in the spring which it will later drop to conserve energy when water is less available. Sagebrush is an important plant for – surprise! – the Greater Sage Grouse. If you don’t know much about this bird, you’re in for a treat, because they are simply amazing creatures. The second largest game bird in North America, the Sage Grouse is in a lot of trouble – its numbers have been declining for decades due to habitat loss and it’s on the list of considered species for the Endangered Species Act. Sage Grouse survive solely on the leaves of sagebrush during the winter, and they need to store a lot of energy for their mating ritual. Up to a hundred males may gather in a clearing amidst the sagebrush called a “lek,” and they’ll “dance” for days in an attempt to win the affections of the females. This dance involves strutting with their feathers out and inflating special air sacs that, when emptied, sound almost like a coffee percolator! If you’ve never had the pleasure to see it, check out the little video below. Check out those females playing it cool by pretending to snack while they size up the boys. Look for this amazing plant all over the Cove, and if you spot it, be sure to rub a leaf between your fingers – sagebrush releases a strong, almost menthol-like scent that some people find delightful. Think of the Sage Grouse, which fills it belly happily with those leaves all winter long. Happy sagebrush hunting! If you’ve been keeping up with the blog, you’ll remember that I recently spotted my first Cove coyote, and I wanted to share some other wildlife sightings with you. One of the best things about working at a state park, especially one as amazing as the Cove, is the opportunity to see lots of wildlife. First up is the Canyon Wren (Catherpes mexicanus). 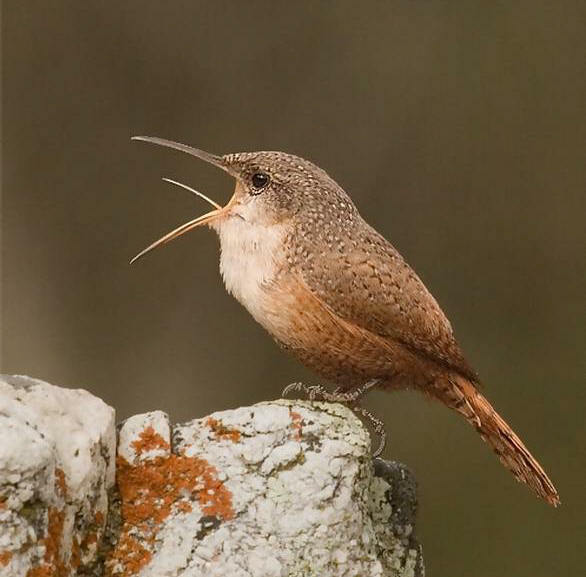 Wrens are compact but bold little songbirds, and the Canyon Wren is a real beauty. I’ve spotted one in the Deschutes Ampthitheater, singing in the surrounding rocks and probing crevices for insects and spiders. I was really amazed at how bright the rufous feathers are, and that tail – it looks like the tail of an itty bitty Red-Tailed Hawk! Also note the very long beak. Click on “Read the Rest” to see the other critters I’ve been getting to see! Next up is.. a blue-belly! 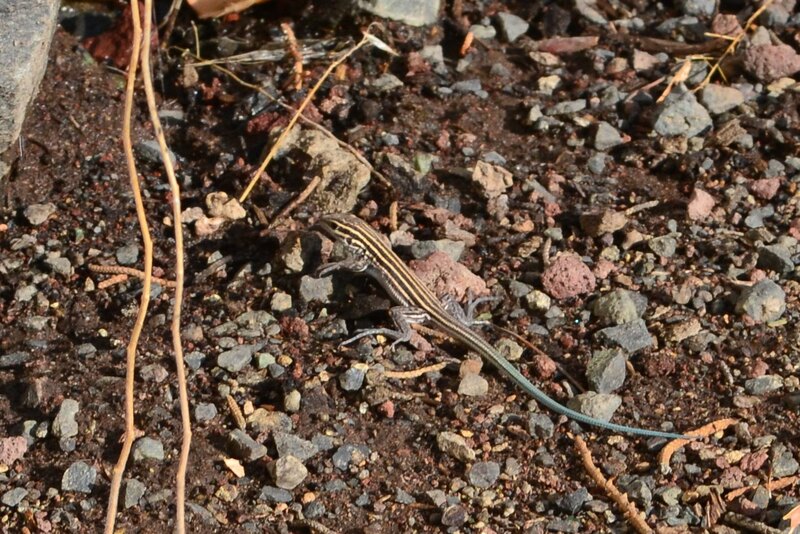 Striped Whiptail. Notice blue tail. 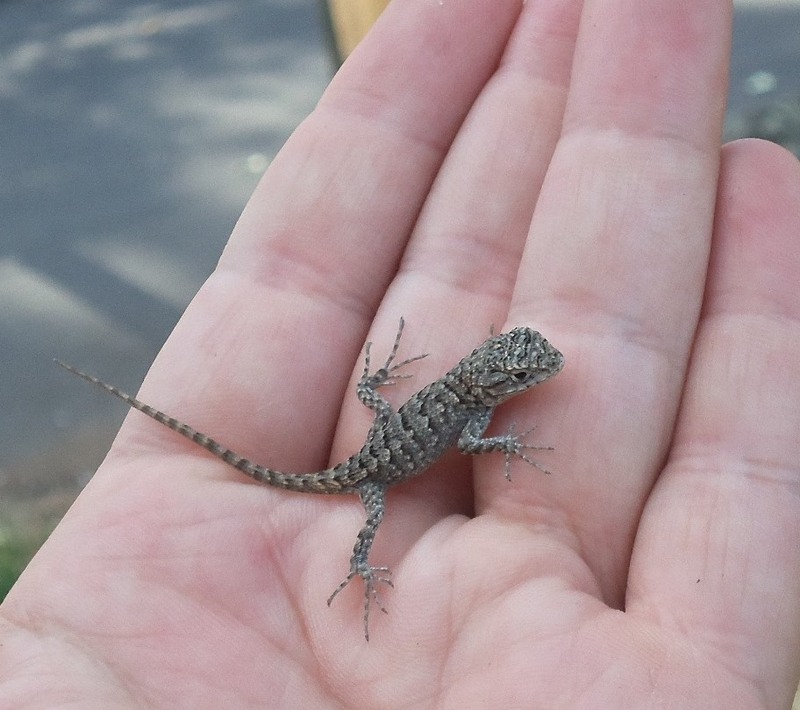 Some people may not think baby lizards are totally adorable, but… I do!